After driving through occasional downpours on my way from Flagstaff, I arrived to a sunny North Rim on Wednesday afternoon. I’m here for three weeks as the artist-in-residence, a great honor since they only picked five for the summer season. 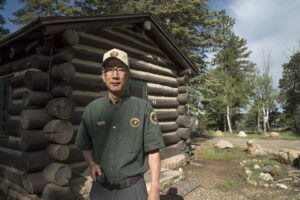 Ranger Robin Tellis filled me in on the details and issued me volunteer uniform tops (long and short sleeves), a fleece jacket, a rain jacket and a cap. Plus an Artist-In-Residence name plate. I’m semi-official looking, though I hope no one asks questions about the Vishnu Schist or various layers in the canyon. A cloud floating UP out of the canyon. They house the artist in a rustic cabin among the various cabins that the staff live in. It’s great, a nice work room/kitchen plus a separate bedroom. It’s also hard to beat the location, the cabin is about 100 feet or so from the canyon rim. 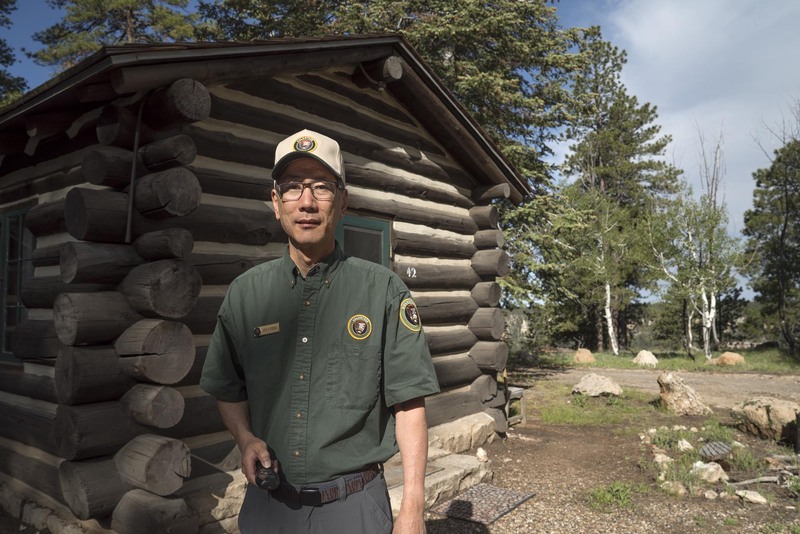 I met my neighbors, rangers who work in different jobs around the north rim, all really friendly. 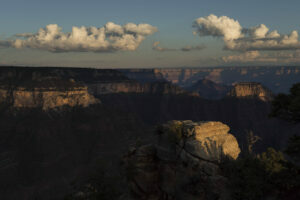 I took a short walk along the Transept Trail, which goes along the edge of the rim. The view was pretty spectacular, no matter which direction you looked. 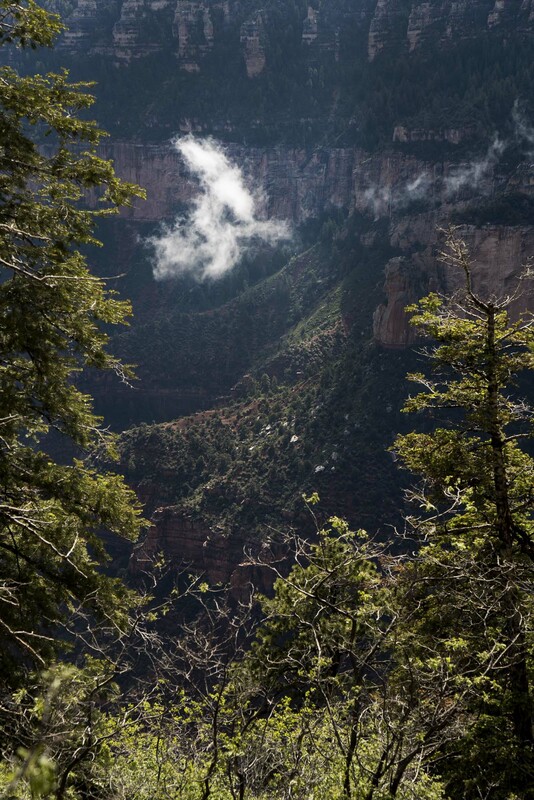 Occasionally wispy clouds would float up out of the canyon like fog. I walked past some campsites next to the trail that had amazing views. It wasn’t quiet, the dull roaring noise was the wind blowing through the tall pine trees, but it was almost a relaxing sound. I hear it at night from inside the cabin. For the sunset I drove to the Visitor Center/Grand Canyon Lodge complex and walked out to Bright Angel Point, which looks out south, with views to the west and east. Orangish light illuminated the tops of the distant formations in the east while billowing clouds provided an equally amazing view to the west. Sunset from Bright Angel Point. The sky cleared and it was a nice but breezy night for stargazing. I walked out to Bright Angel Point, just out from the Grand Canyon Lodge which is a really impressive historical hotel made from wood. 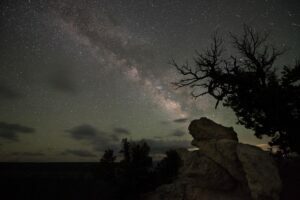 Walking along the rim trail I looked through the pine trees and saw bright “clouds”, which turned out to be the Milky Way. Coming out on a clearing the whole expanse of the galaxy was seen. It was quite an impressive sight, every feature could be clearly seen. At over 8,000 feet and after the storm cleared through the air was nearly pristine. 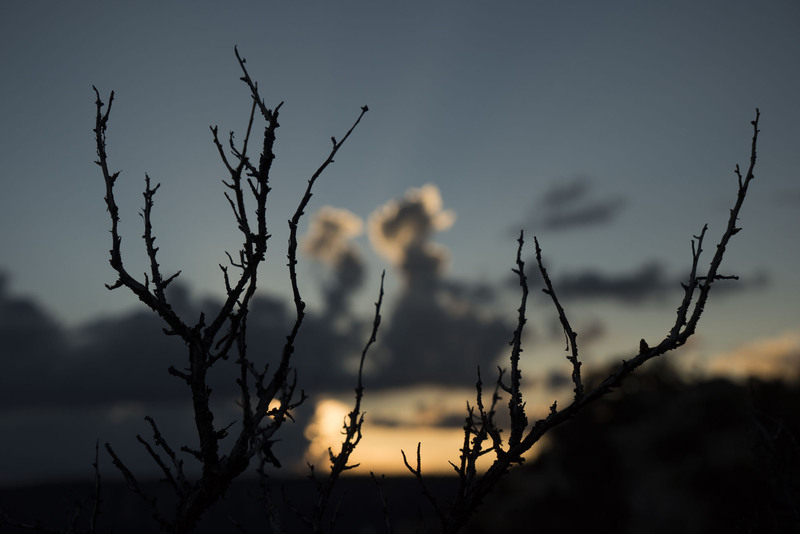 Around 1:15 am in the morning the clouds began returning and I headed back to the cabin. The Milky Way arching across the southern sky. Looks like a great start to your time at the canyon! Looking forward to following along for the next few weeks. Thanks Matt, I see lots of possible palladium prints here!